Earlier this month telecom operators approached the Postal and Telecommunications Regulatory Authority of Zimbabwe (POTRAZ) requesting for tariff adjustments in light of the newly floated RTGS dollar. Effectively, POTRAZ has refused to grant the request. The circular sent to operators by POTRAZ sounds quite contradictory because it mentions how the operators are facing a number of challenges which include lack of foreign currency and increasing operating costs and of course the big one: the devaluing of local currency by a minimum factor of 2.5. POTRAZ justifies the stance they have taken using a model called Long Run Incremental Costing (LRIC) which the regulator adopted in 2015. According to POTRAZ mobile networks were already charging above the pricing structure that their model proposes therefore they were already cushioned and are well able to absorb the devaluation of money in Zimbabwe by at least 250%. 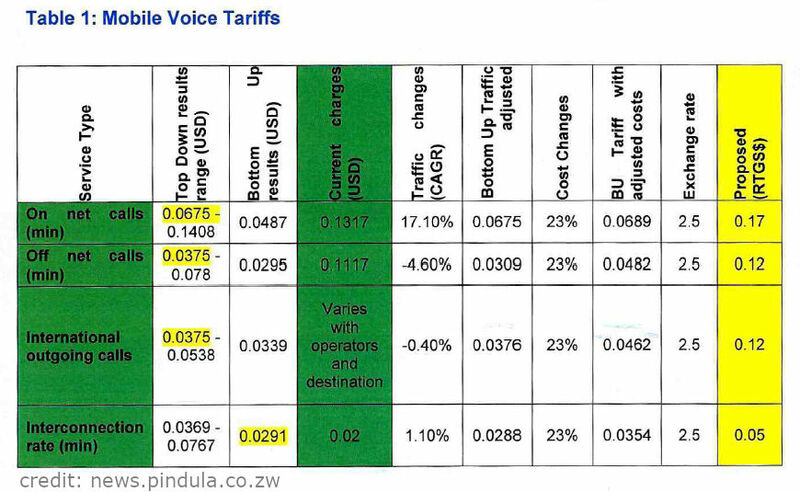 In short, local voice calls have increased by 1c (RTGS cent btw). That above shows that POTRAZ increased the tariffs from USD 5c per MB to RTGS 5c per MB. No, I didn’t make a mistake, according to the POTRAZ rational, they actually increased tariffs. I’ll leave you to process that. As consumers this may sound to us like it’s the best news ever only to be beaten by a lowering of the tariffs from where they are in RTGS terms. However, we are likely to find ourselves worse off. The quality of services has been very erratic lately and this is mostly attributable to operational challenges faced by MON’s. As POTRAZ themselves allude to in their recent annual report, operational costs incurred by MON’s increased by more than 25% in 2018. This is not the worst though. The bigger deal is that telecom operators have not been given any priority by the central bank to access foreign currency for their equipment and other imports needs. This has put the operators in a very precarious position where they owe their external suppliers in USD and now the suppliers don’t want to keep supplying them on credit. We thought after all the rhetoric from the regulator they would grant tariff increases in line with the USD:RTGS rate. POTRAZ did not see any sense in that. In short, we are likely to pay a steeper price in the form of service interruption and poor connectivity. The operators will most likely adjust their bundle offerings to protect themselves as much as they can. We should realistically expect to have less MB in our bundles. Even the WhatsApp bundles could also see some adjustment. Econet has already started working on tweaking their bundles. For on net calls and international calls, POTRAZ multiplied what TelOne was already charging to come up with a new tariff ceiling. Being a struggling fixed voice operators seems to have its advantages, TelOne has a little more room to charge viable prices. Expect the network quality to deteriorate further. Also expect some shuffling of data bundles. Futher expect the government to struggle to sell off NetOne and Telecel or even worse, to sell them for a song because the investors will point to unviable pricing constraints. The pricing is no excuse for poor quality, even when things where ok the quality has always been poor. The main issue is not on cost of running business but on return on investment to the people who put money into the companies, the companies have the capacity to offer good service and are just not doing so. Say mobile data tariffs, not data tariffs in general. ZOL tariffs are not under POTRAZs authority, and those have been increased. Why is ZOL not regulated by POTRAZ? Please explain?